Total War fans were elated when developer Creative Assembly announced that it would be releasing a new spin-off series named Total War Saga. The main difference is that unlike the core Total War games, the Saga titles will focus on specific periods of history instead of spanning entire historical eras. This means these games will be more like 2012’s Fall of the Samurai, an expansion for Total War: Shogun 2 which focused on the Boshin War in Japan in the 19th century. This should allow for more storytelling opportunities and for Creative Assembly to bring specific eras to life with more detail than before, so it’s logical that fans of the series are excited about these new Total War spin-off games. But while it’s clear this is a game many Total War fans are looking forward to, it seems those eager to play Thrones of Britannia will have to wait a little longer than anticipated. This is because Creative Assembly recently announced on its blog (via PC Gamer) that the game’s release date will be postponed two weeks, meaning we won’t get to play the game until May 3, 2018. The reasons for this as Creative explains on its blog are polishing, balancing and getting rid of pesky game bugs before Thrones of Britannia’s release in early May. Changes being made include adding more information and detail to the game’s user interface, and also graphical improvements to general’s portraits, which now change as your general ages in the game, surely a welcome addition to the franchise. And it’s likely this upcoming Total War game will look better overall than its predecessors did, given how Creative Assembly has been improving the games’ visuals with each new release. 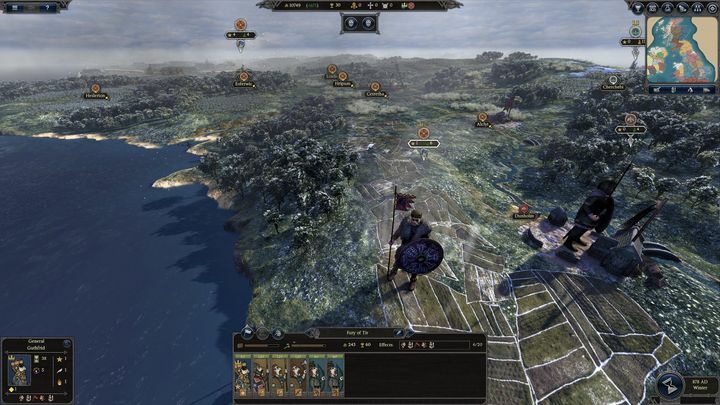 Creative also revealed that it is making improvements to the game’s AI, something that most Total War fans will likely welcome as the AI has never been Total War’s strong suit. Actually, playing against the computer-controlled factions has never been that challenging, especially in the game’s real-time 3D battles, so it’s good to hear that the British dev is hard at work on improving the AI in the game. And it would surely be a great thing for fans of the long-running series if this turned out to be a great Total War game then, and a good start for the Total War Saga spin-off series when Thrones of Britannia ships later this year. Note: Total War Saga: Thrones of Britannia will be released on May 3, 2018. Available on PC.